Kentucky has suspended the $18 million in state sales tax rebates to the Ark Encounter, saying it has violated the terms of the incentives approved by the state. State officials notified the theme park in Williamstown in Grant County claiming it had violated an agreement with Kentucky by switching from for-profit to nonprofit company, according to the Courier-Journal. A letter by the state Tourism, Arts and Heritage Cabinet noted that the park's owners on June 28 transferred the property from Ark Encounter LLC, a for-profit company, to Crosswater Canyon, a nonprofit subsidiary of Answers in Genesis, a Christian ministry that runs the Creation Museum in Petersburg. It said the switch was in violation of its agreement for the tax incentives. "When they became a nonprofit entity, they became in breach of their contract," Laura Brooks at the Tourism, Arts and Heritage Cabinet told WHAS 11 News. Ark Encounter disagrees that it was in violation of the agreement. "We don't believe that the transfer of the property created a default, but we will comply with the concerns that the tourism department may have related to the transfer," spokesman Mark Looy was quoted as saying. Park officials "look forward to maintaining a positive relationship with the state long into the future," Looy added. The transfer could exempt Ark Enoucnter from property taxes. Mayor of Williamstown Rick Skinner says he is concerned. "I'm not sure what will happen next, disappointment is there," the mayor was quoted as saying. Ark Encounter has 30 days to respond to the breach of contract. The Wisconsin-based Freedom From Religion Foundation, which hails itself as the largest atheist group in the United States, has posted the letter from the Tourism, Arts and Heritage Cabinet on its website. 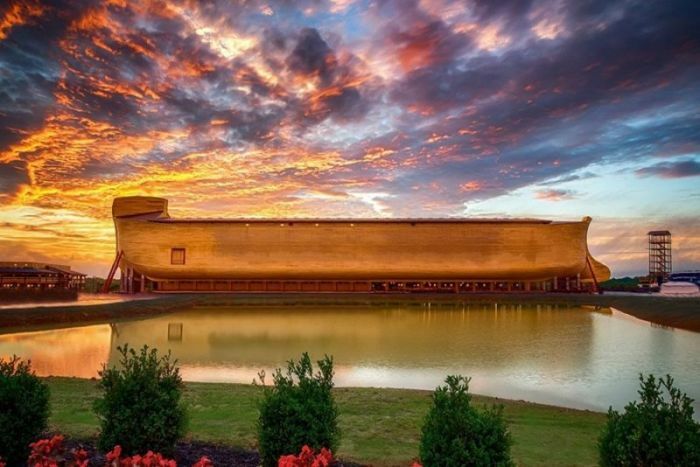 In February, a Virginia city's Parks and Recreation Department canceled a planned trip to The Ark Encounter and Creation Museum for families after the atheist group claimed it would violate the Constitution due to the exhibit's "Christian and proselytizing nature." "Advertising and organizing a trip to a Christian ministry constitutes government endorsement of religion and alienates those Christiansburg residents who are not Christian and are nonreligious," FFRF Attorney Andrew Seidel wrote to Brad Epperley, director of the Christiansburg Parks and Recreation Department at the time. "It is a fundamental principle of Establishment Clause jurisprudence that the government can in no way advance, promote or otherwise endorse religion. Advertising and organizing such an event sends a message that residents are expected to endorse such events." Creation Museum President Ken Ham refuted the argument. "If public schools were bringing students here and their teachers were saying, 'THIS interpretation is the only truth that you should personally accept,' then that would be a violation of the Establishment Clause of the Constitution," Ham told Christian News Network in a statement at the time.